The Papyrus “ghost” text is similar to “hidden texts” in other word processing programs, but they can do more. Ghost texts will remain hidden when you print your text, or export it as an e-book or PDF version. This function is especially useful when you are writing a book and want to store large amounts of background information, which wouldn’t fit in a comment or a short note. It’s also helpful when you have unfinished chapters, or basically any type of long text passage that you would like to keep with your text, but which your reader shouldn’t see in the finished version. If you want to turn an entire scene or even a chapter into a ghost text, you will still be able to see it in the Navigator. This allows you to always have a good overview of your main text as well as any background information. Ghost text (even in its “ghostly” state) will also keep extra information about your text–text style, comments, pictures and even footnotes. “Ghost” is a text attribute that can be turned on and off for a selected area of text. To return a ghost text to normal text, use the context menu (right-click) or double-click on the ghost symbol in the text. Chapter, scenes and events you have marked as “ghost text” will be shown with a ghost symbol in the Navigator. Numbered “ghost” chapters will be handled as if they were set aside. They are displayed with an “X” instead of a number so that your normal numbered chapters will not be affected. 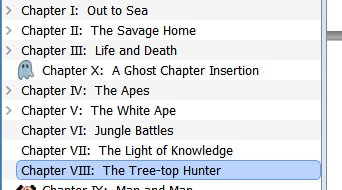 These ghost chapters will appear in the Navigator, but not in the table of contents. Normally, ghost text will not be printed and will not show up in PDF versions unless you choose otherwise (can be changed in “Special Print Options” and “Revision Tracking”). If you choose the mode “Display as Print Preview,” all ghost text will become invisible (except in the Navigator). You can, however, choose to display it again (under “Ghost Text Colors”). Under “Preferences” → “Revisions and Comments” you can change the colors of the visible ghost text. Here you also decide whether the ghost text that is not shown should be visible in a comment box. If your ghost text appears in a comment box, pictures, tables, and footnotes will not be shown (they will, however, still be saved while hidden).